I told you I bought a lot of greens this week. You can call me Salad Monster. I don’t know. I just know I’ve been eating a lot of salad. 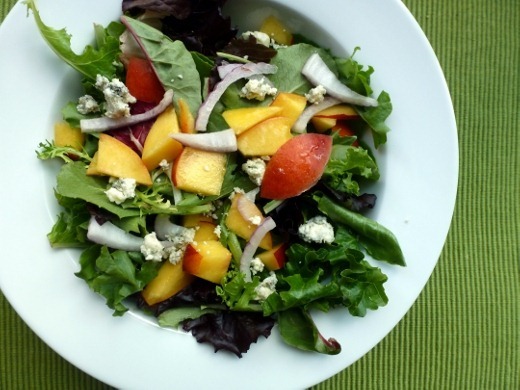 Like yesterday, I had an overflowing bowl of mixed greens with peaches, gorgonzola, and red onion. Yumtastic! Pretty sure I threw some sort of dressing on there too, just can’t remember what. With my salad, I had homemade soup! 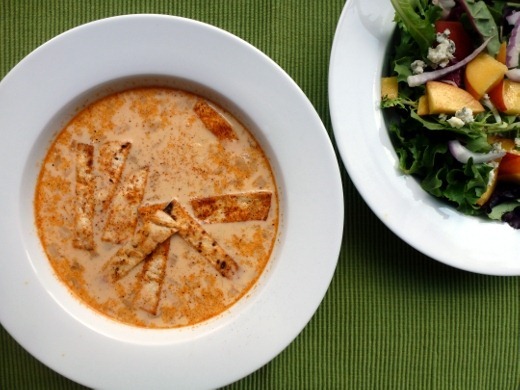 This is meant to be a slightly healthified version of Chili’s Chicken Enchilada Soup. I should preface this post with the fact that I have actually never had the “real” Chicken Enchilada Soup at Chili’s before; this just sounded, well, good! 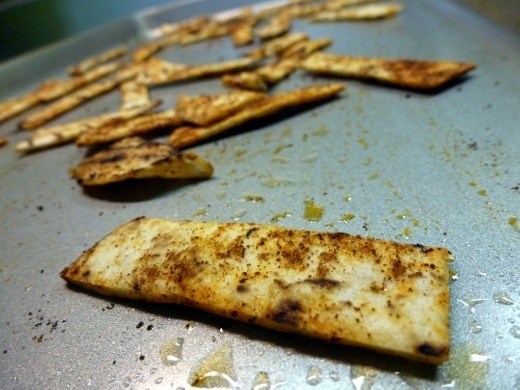 I started by making some crispy tortilla chips in the oven. These were flour tortillas that I brought home in my take-out box from the summer picnic, cut into strips, brushed with olive oil, sprinkled with chili powder, cayenne pepper, and salt, and baked at 400 F for six minutes. These were yummy! 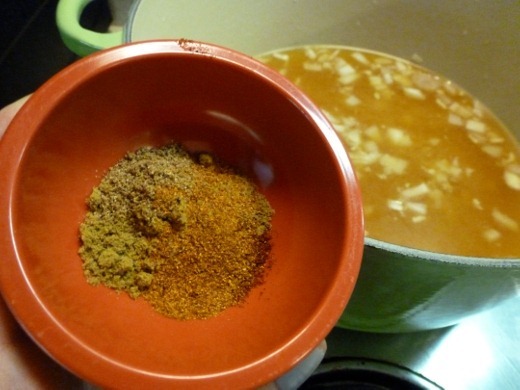 Next I sautéed onion and garlic, added water, chicken bouillon, cumin, coriander, chili powder, and cayenne pepper. 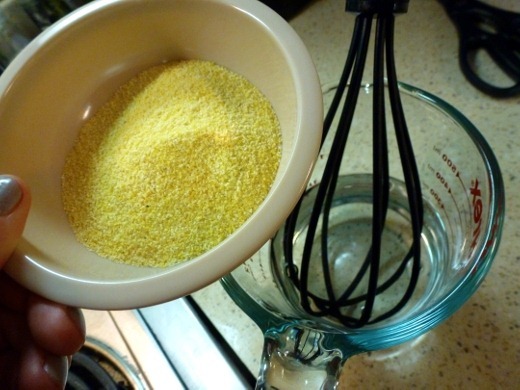 I also whisked in 1/3 cup cornmeal, which added a nice texture to the broth, giving it a more substantial mouth feel. 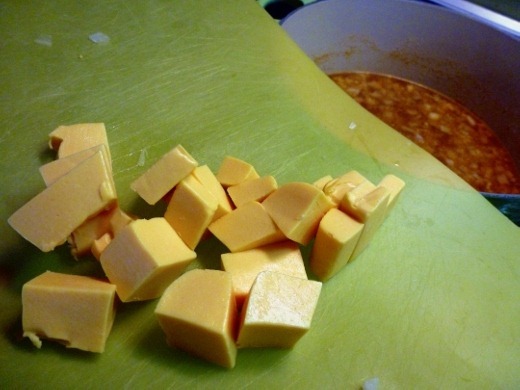 More good stuff: cubed Velveeta! You know I love the stuff. Garnish with shredded cheese of your choice (pepper jack for me, which sunk into the soup but tasted good!) and crispy tortilla chips. The recipe also suggests topping the dish with pico de gallo, which I think would be a really nice, fresh addition. If I made this again, I would definitely add the pico de gallo, or at least some diced tomato or minced cilantro to freshen things up. With that said, this soup was wonderful. 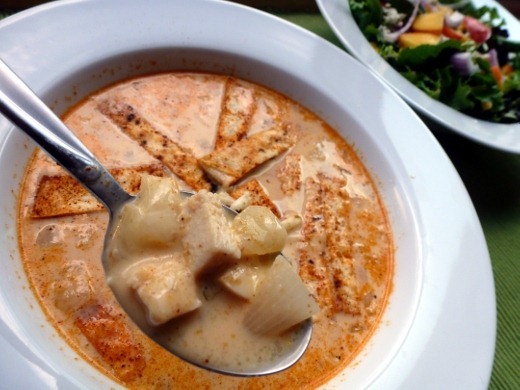 I loved the cheesy, flavorful broth. 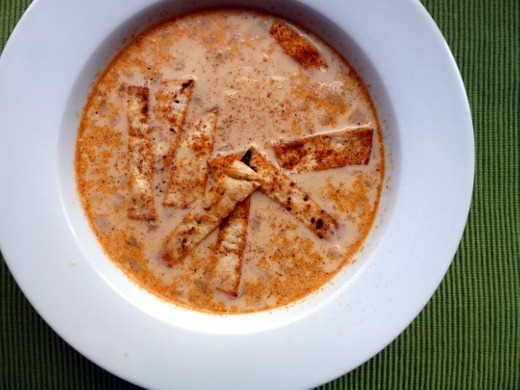 I really like looking at this soup, so I hope you do too, because I have a lot of pictures and couldn’t narrow them down to one. I think potatoes would be good in here too. Or maybe broccoli? Tomatoes definitely. Calories: 1 cup = 266 calories. More greens! 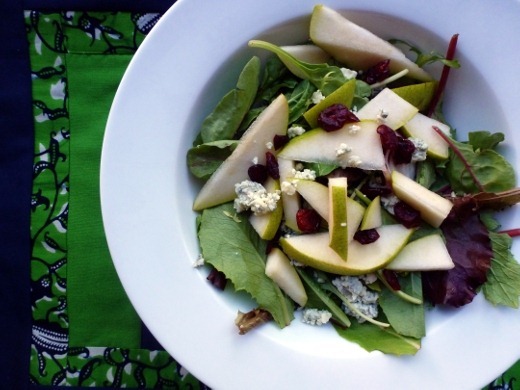 Tonight we had them with sliced pear, dried cranberries, and gorgonzola with raspberry walnut vinaigrette. Another “makeover” recipe, and this recipe is one I have made before, which you can read about here. The assembly was a bit neater this time, as last time I learned that I didn’t need as much filling as the recipe calls for, so this time I scaled back. I also airbrushed the baking pan below, pretty hastily, because it looked pretty ugly. But the stromboli looks good, right?! 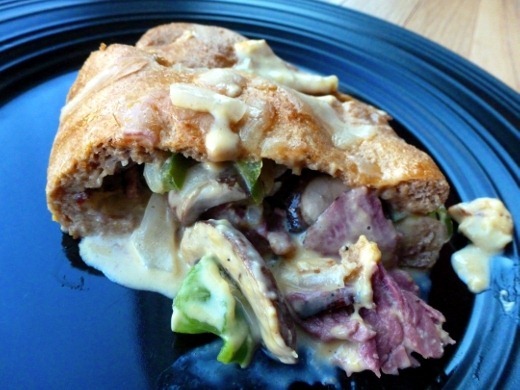 This Philly Steak and Cheese Stromboli is one of the most difficult food items to photograph! It does not look cheesy at all below, but in fact there is orange Velveeta oozing out of the bready goodness. Just take my word for it. Or go look at the evidence in my last post. 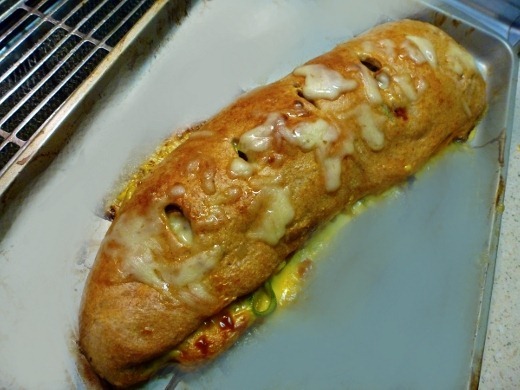 This recipe can also be found over at Taste of Home: Steak and Cheese Stromboli. Currently listening to: My Body is a Cage – Arcade Fire. 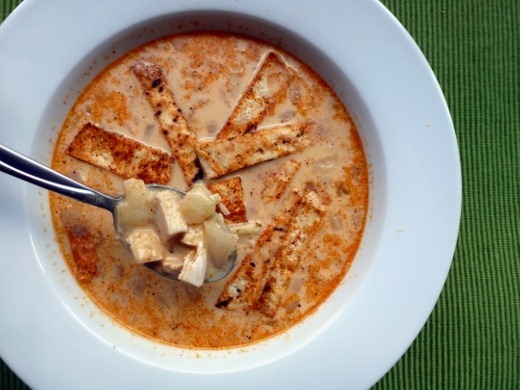 Pingback: Meal Planning for Week of August 5-10 « Meg.Goes.Nom.Nom. 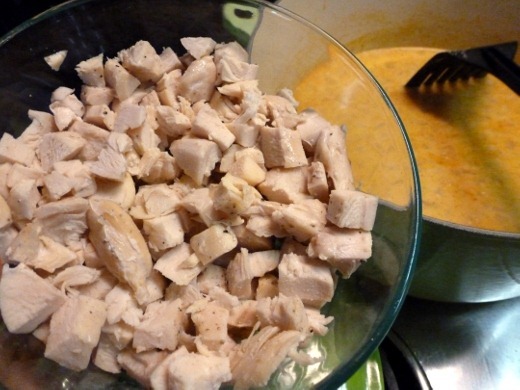 Pingback: Rich Chicken Soup + Chicken Soup Recipe Round-Up « Meg.Goes.Nom.Nom.